What Solar panel you needs? A 12 volt solar panel will give an “Open circuit voltage” of around 20 volts in bright sunlight. But it drops to 12-15 volts when connected to a load. No problem, a 12 volt Solar panel is sufficient. But you have to consider its “Wattage” which is the power delivered by the panel. Suppose you need to run 100 Watts appliances total for three hours every day. Now multiply the total watts using with the hours to run = 100 x 3 = 300 Watts. So you needs total 300 Watts for 3 hours. Suppose the Sunlight is full only 6 hours in a day. Then divide the total watts with the hours of sunlight. 300 Watts / 6 Hours = 50 Watts. That is ,the panel should give 50 Watts per hour. So you need a 50 Watts solar panel for your needs. Now select a 12 volt 50 Watts solar panel, so that you can run the 100 Watts appliances for 3 hours daily with Solar power directly. If you use a 100 Watts solar panel, then you can increase the usage hours to 6 hours. What type of Inverter you need? Inverter is an electronic device that converts DC (Direct Current) to AC (Alternating Current). This DC can be from the Solar panel or a Battery. Most of the Inverters are 12 volt types and its power rating is in “VA (Volt Ampere)”. That means, the Voltage using x Current (Ampere) use of the Appliance. Inverters like 300 VA, 500 VA, 800 VA, 1KV, 2 KV, 5 KV etc are available. But we need only a small type since the “Wattage of load “is only “100 Watts”. So you can select a “300 VA Inverter”. 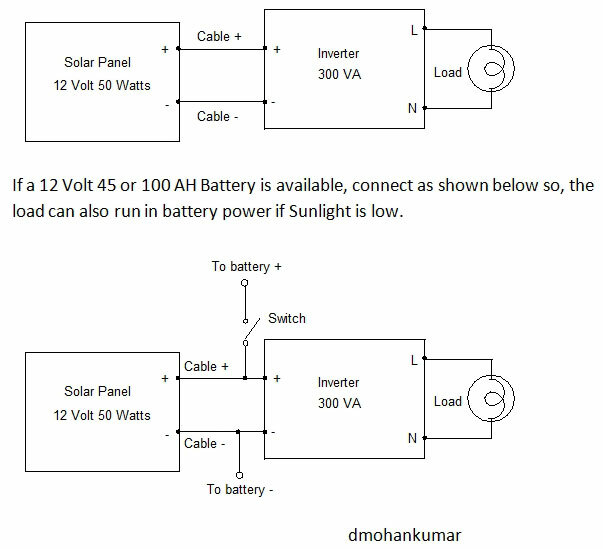 How to connect the Solar panel, Inverter and Load? Solar panel is just like a battery that generates current when sunlight falls on its. Numerous “semiconductor stripes” are on the panel and each unit is called a “Solar Cell”. As a rule, each “10 Watts” solar panel gives “1 Ampere “current. But it depends on the sunlight. The Solar panel has two “terminals” marked as + and –. Connect a good cable to the positive and negative terminals and note the wires for the polarity. If two coloured wires are used, it is easy to identify the polarity. It is better to use a high gauge wire to handle current. You can use 1 mm electric wire. Place the Solar panel on the roof top in the East – West direction at an angle with the panel facing the sky. So all time, the panel gets light when the sun moves from east to west. Now bring the Cable to the house where Inverter is placed. The Inverter has Inputs for solar panel and output for the load. Connect the cables to the inputs of Inverter observing the polarity. It also has + and – markings near the connectors. Load should be connected to the output. Since it is AC sometimes no marking is present but usually L and N markings will be present. The loads must be Bulbs, Fan, TV, etc, but maximum 100 Watts. Here you can see the wattage of some appliances. Bulbs- 15, 40, 60,100 Watts. TV – LCD 40-100 Watts, CRT- 100-300 Watts. If battery is also used, cost will hike. Solar panel needs periodic maintenance to increase its life and efficiency. Usually a Solar panel will work well up to 20 years. So once in a month, clean the surface of solar panel with moist cloth and clean the terminals to remove rust and reconnect the wires with clean tips.